We are running our fantastic Holiday Gym program again these holidays. Come along for two to four hours per day Tuesdays Wednesdays & Thursdays, both weeks for just $5.00 per hour. What a great way to celebrate the 1st day of Spring at the Central Coast Grammar School Spring Fair. We had a great day entertaining the crowds. Here are some pics of the Development girls. 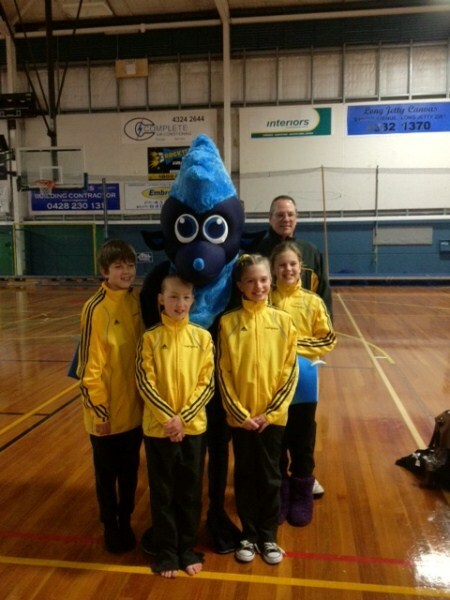 At the Trampoline competition held on Sunday, our gymnast & coach stoped for a quick photo with the NSW mascot. We had more great results from some of our gymnasts as they entered a school based competition on the weekend. The girls took several apparatus placings as well as overall. Fantastic effort girls. Here are some pics of the fun day. Two of our Acrobats Ashleigh Wells & Keely Gemell were nominated in the Acrobatic Gymnasts of the Year section of the awards night. It was a great honour to be nominated for such an award and we are very proud of both girls. Wow, what an amazing year it has been for this young lady. Karina was presented with her award at the NSW Annual Awards evening held on Sunday night. We are so very proud of both Karina and her amazing coach Michaela. Well done Karina!! We couldn’t resist being part of the fun in London, so on Saturday we ran our own Olympic Fun Day. It was a great success with all the gymnasts taking part. Here are some pics of our fun day. We followed with a BBQ and treats, there was even an Olympic cake. Ribbons for All & Blue Ones at That!!!!!!! Our Gym attended the N.S.W. COUNTRY CHAMPIONSHIPS over a 4day weekend. We had some wonderful results and brought home a swag of medals. Gosford Gymnastics entered Gymnasts in WG, Rhythmic, Acrobatics and Trampoline Sports. Here are some pics of the Acrobats who took out Gold for everything they entered. Here are some of the National Development girls about to have some fun on the air track.